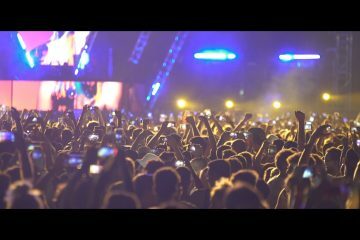 In the modern digital age, DJing is many things to many people. It can be the size of a van, or fit in your pocket. And just when you think you’ve seen every paradigm, along comes another that welds together the traditional and the new into a single standalone unit. The JD Sound PDJ has garnered much attention since showing its face on the market. We first saw it way back in October 2012, where it certainly gathered the usual disdain, but also a solid amount of positive words too. But now it’s reached the UK, and is being handled by my good friends at Vestax UK. And so confident were they that I’d be hooked on the PDJ within an hour, they wagered a meal on the outcome. Will I throw a review just to win a bet? Read on. 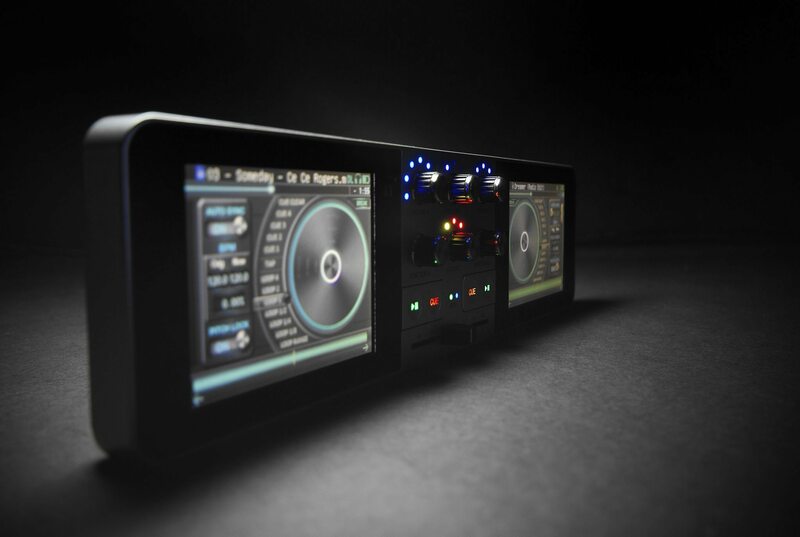 The PDJ is an extremely portable DJ device, consisting of rudimentary hardware controls sandwiched between a pair of touch screens. The PDJ also has microphone and external inputs as well as a single output. Music is added via SD card, and the internal battery is charged via USB. 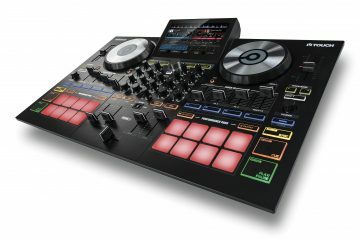 So the PDJ really is a complete DJ system crammed into something about the size of a large remote control. Manual: PDJ Manual PDF — read this to find out what the PDJ does in detail. Reviews are for us to tell you what we think about what it does. JD Sound certainly pushed the boat out with the packaging. Plastic sleeve, outer sleeve, inner box, foam protector layer, velvety cradle, and another box for the international power supply… and a high quality but nearly illegible manual. 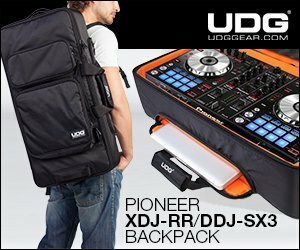 I don’t know if this box is designed to be the carry case as well, but I’d preferred to have seen more basic packaging wrapped around a nice case that would allow you to cram the PDJ in and out of the hostile environment that is the DJ bag. Once you’re past the ooh and aaaah of the box, the JD Sound PDJ appears as a pleasure to behold. It’s not quite the DJ device that Apple would make, but near enough. The case feels weighty, and although looking like a unibody is in fact plastic. I suspect the internal batteries make up the weight as bar the glass touch screens and the ports, everything else is plastic, albeit high quality. And for those who plan to use this as a handheld rather than tabletop device, the back has some nice flat slight rubberised pads to make holding the PDJ a lot easier. So overall, the PDJ package feels lush and in the realms of the £399 being asked. Many will disagree, but given the nicher-than-niche market, and the probably high costs involved in making this (miniturisation costs money, especially in small quantities), the PDJ does well to come in at this price. Let’s take a look at the more traditional elements of the PDJ, and arguably the reason it exists in the first place. 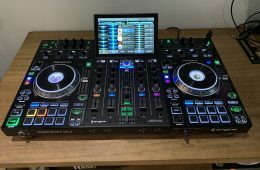 Let’s be clear — touch screen DJing is nothing new, but the very fact that controllers exist at all shows that people do want a tactile experience as well as the convenience of touch controls. 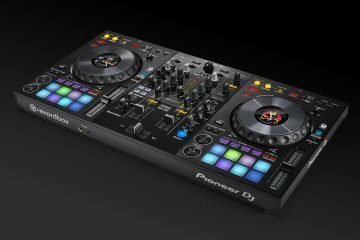 So the PDJ has a smidgen of knobs and faders, each with specific features that mirror conventional DJing, but also tie into the touch elements too. Firstly, there’s a crossfader. It’s a long way from being the best in the world, but does the job. The knob is narrow, and the travel feels more console than DJ. There are settings to define a regular dipped curve, a sharper curve, a useful EQ tweaking curve and to turn it off completely. No amount of curves will ever allow this to be useful for scratching, the EQ crossfade (brings in the highs of the new track first and takes out the lows of the old track first) did give some nice transitions, although this is really shorthand for doing with the EQs anyway. Top left and right are the channel and monitor volume controls. It’s basic stuff – turn for volume up, press and turn for headphone volume, and press to engage monitoring – either both ears, split or off completely. The remaining 4 are to directly control the internal elements. To make sense of the others, we need to dig deeper into the inner workings of the PDJ. This is one of the several surprises that awaited me when dipping into the PDJ. It comes with 6 perfectly adequate effects (phaser, flanger, delay, filter, roll, and bit crusher), that all apply to the master channel. What I found interesting was that you can apply them all at the same time, with no apparent quality hit. Yes, it’s a bloody racket of course, but they can all be switched off at once by turning the FX select knob full to the right and pressing to kill everything. One thing to note — because effects are applied to the master, there’s no cueing of effects. You’re left in the realms of having to check the master out to hear what’s going on. Some effects have different parameters, enabled by pressing and turning knobs. When you’re used to full-sized controls or even complex FX units, this all feels a bit cramped. limited and tricky. But when you realise that it’s a miracle that the PDJ has a DSP at all, let alone 6 effects all of which can be applied at the same time with wet/dry and parameter controls, it soon becomes apparent that it’s a matter of learning how to use them and just what can and can’t be done with the limited feature set. Now we’re in the realms of the screens and exactly what they can do. The main screen manages to cram one hell of a lot into it. By today’s standards, it’s quite low res and has a decidedly bluey-grey theme. It wouldn’t have hurt to employ a tad more of the colour spectrum in the PDJ. Note to the developers — colour waveforms please. Half of the screen is dominated by a rotating platter. This platter is a multi-purpose wheel that allows you to scratch, pitch bend and simulate spin downs amongst other things. Despite the obvious hampering of technique inherent with a 30mm touch jog wheel, I was able to pull off the most basic of scratch techniques, and when firmly secured to a surface, I even managed basic juggling too. But part of me wanted it gone completely and the screen given over to other features more suited to touch screen DJing. Hot cues for example would have been lovely if they’d had touch screen buttons available. Instead, you have to use the function knob to define and trigger them, which is absolutely fine if you want to quickly jump to parts of a track, but not too clever if you wanted to do some clever controllerist stuff. I did just about manage to work up something nice with “tank fly boss walk jam nitty-gritty” but it was a chore. This is strictly for jumping to parts of track than anything else. Usefully, hot cues are saved with the track, and visible in the library view. I also really like the fact that if you’re rocking doubles, defined hot cues on one appear on the other instantly. Loops are pretty well catered for though, You’re given loop ranges from 32 beats down to 1/8th, selectable across 2 screens, and engaged with a simple press. I like that you can easily crunch down and back again with a simple turn, or come out of it with a button press. The success of the loops will come own to the accuracy of the analysis, which generally is accurate… when it can get it right. Some tracks that normally would analyse fine seemed to throw the PDJ somewhat. Deelite’s “Groove Is In The Heart” is a pretty basic 4 to the floor groove, but it came in at 160bpm. Rozalla’s “Everybody’s Free” was 89bpm, both of which are clearly wrong, but easily fixed with the tap function, where you can tap in and save the BPM into the library. The moral of this story — check your tracks before trusting the PDJ, because it’s a bit poor at BPM analysis. Which leads me neatly to sync. As is custom in the modern digital age, a sync feature has been included, but frankly is quite a letdown. While the BPM might be calculated, there’s no beat grid, so engaging sync throws up some unexpected results, with no easy way of fixing it. There is a pulsing beat light, but without the beat grid, it’s flashing more or less whenever it wants. It’s the kind of thing that you’ll learn the shortcomings of, but it really should work better than this. A swipe away from the main screen are the EQ settings. You get 3 bands which go down to -25dB and up to +10dB. This can be done with multi-touch so you can push all 3 at once, or assigned to the function knob to manage one or all of them, with a handy 0dB reset assigned to the press. 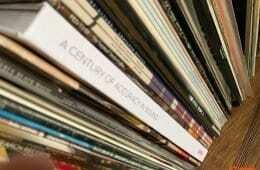 A word on sound quality — it’s OK but nothing earth shattering. With a little help from the EQ, I was able to get something better, but it’s only to be expected from such a device, and via a mini-jack output too. One Shot: As it sounds, one hot, one sound that plays in full. Loop: Plays like a one shot, but if kept pressed plays every beat until you let go. Drone: This sound plays only for as long as pressed. You can only play 2 sounds at once, which I found to be enough. And you can load in new ones as well. It’s quite an arcane method of plugging in via USB and dropping files into folders, but it does at least work. Overall, it’s a good implementation, one that I didn’t expect to find on this device, but was very happy to nonetheless. Yet more functionality is hidden in more screens, and one such gem is the sequencer. It’s a bare bones implementation with 8 beats and 6 instruments that locks to the BPM of the playing track. To be honest, at the time of writing it feels unfinished. The documentation is light on detail, and there seems to be no way to load new sounds, or to preserve your own sequences across a restart. It’s great for creating a simple bridge beat, and has the promise of good things if the developers assign more time to it. 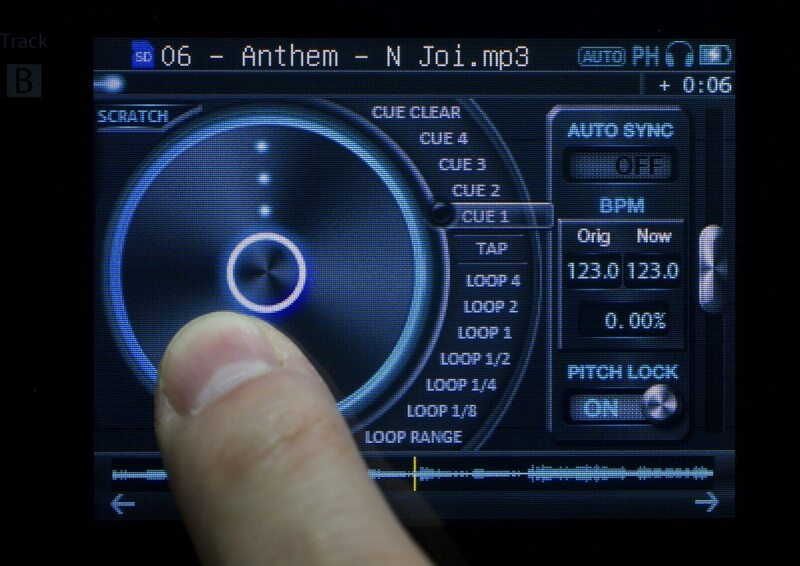 The JD Sound PDJ isn’t exactly a powerhouse of music format compatibility, but does work with MP3 and WAV files. While the PDJ does have 4Gb of internal space (although mostly reserved for system and recording), you can work from SD card, up to 32Gb which for the potential user of this is ample. SD does make music organisation easy as you can do it directly from your computer, and is simple as copying a folder structure over to the SD card. You can also leave the SD card in the PDJ, enable USB mode in the setting menu and work with your music directly to the SD card. 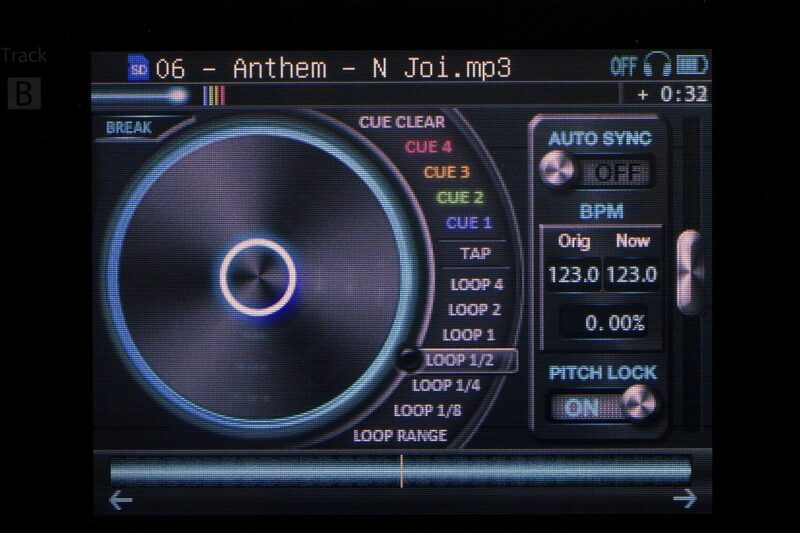 Once inserted, the PDJ will happily analyse all the music for BPM and waveforms. You can still load in tracks that have yet to be analysed, but it’s just good practice to load up your SD and let it do its work. As is the joy of having 2 separate screens, loading tracks is done on a per deck basis. Using the ubiquitous function knob is best, but you can double-click around the touch screen if you like. There are file name, track name, and BPM tabs to allow you to find tracks quicker, as well as a pseudo search function which is essentially an alpha-numeric touch strip. It’s not the quickest or most intuitive of library methods, but does work as well as can be expected with a single knob and small screen. For such a small unit, the PDJ is surprisingly accomplished, albeit via mini-jacks. We covered headphones and monitoring controls, as well as outputs too. 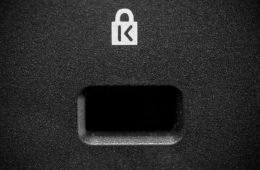 What we haven’t covered are the inputs — there’s a microphone and line in, allowing external devices to be connected up. They don’t route straight through to master out, but instead take over a deck, so if you want to talk over a playing track, you have to select the mic input via the library screen to get the mic to work. What I am immensely impressed with is that you get a decent amount of the deck controls enabled on the live inputs. I know it’s crazy, but you can scratch slip mode style with a live input — so yes, you can do live scratches with microphones, and use effects and even loops. So in theory, you can use a pair of iPods connected up to the PDJ and use it as a rudimentary mixer with the ability to do more than just play tracks back to back. I find this to be deeply impressive for such a device. Whilst the PDJ is quite intuitive, it’s definitely worth a flick through the manual to understand everything that is on offer. The system menu for example throws up a few things that will change how you interact with it, and generally stabbing around the menus for a couple of sessions will yield more choice than you thought you had. For me, it’s a simple matter of realising that the PDJ isn’t 2 turntables and a mixer, nor is it an iPad, but is in fact unlike anything I’ve used before. If I were to try to relate it to something, it would be the Stanton SCS.4DJ, albeit with a lot less physical controls. I like that it can use a large SD card and analyse by itself without having to be told. Once mastered, loading tracks is quick and simple, as is mixing, EQing and applying effects. I’m especially impressed with the on the fly manipulation of the live inputs. You can of course just leave it playing on its own via AutoDJ. Select a folder, and the PDJ can slam mix or attempt to mix your music unattended. It sort of works, but certainly isn’t a replacement for an actual DJ mixing. It is however almost certainly good enough for a house party or bar that just wants a device to constantly cycle music. On that note, I found the battery life to be pretty good. I’ve sat playing with this for 2 couple of days solid and only recharged once, and the PDJ has been playing music for around 6-8 hours solid per day .Also included is a record function, which streams your master output to a WAV file in a specific area of the PDJ’s internal memory. 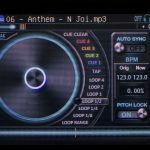 Plug the PDJ into your computer to access the recordings. It’s uncomplicated and simply works as it should. It would be fair to say that there are hurdles to overcome, like the way BPMs aren’t always calculated properly, and how sync just doesn’t work well enough to be reliable, and how features like the sequencer seem to be an afterthought. 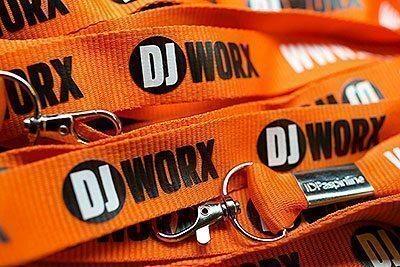 But when I think about how engaged I was to make the PDJ work as a DJ tool, these shortcomings were soon worked around, with the hope that they’ll be fixed in future firmware upgrades. Let’s be quite clear — the PDJ is not intended to be a replacement for a conventional setup. It is however a capable DJ unit, that can pull off a full set once you’ve mastered the foibles. It has a certain cool factor to it, to the point where I could see P Diddy or Will.i.am pull one out of their pockets in a music video. Where it truly does score is in the portability stakes. This will go quite literally anywhere and be completely unobtrusive in use. Bus, train, plane, office, hotel, restaurant, dentists, doctors, coffee shop — the PDJ fits in a pocket, can host a lot of music, as well as last for a long time. This is the real selling point of the PDJ — it’s a teeny-weeny self contained box of trick and tracks, that requires no laptop, and if charged up, no power either. So to the price — £399 in the UK is not cheap by any means, but I can see why it’s at this price point. 2 touch screens shoehorned into a small case with long-lasting internal batteries was never going to be cheap, but it’s still highly desirable, especially as it’s totally self contained. It’s a very convenient backup device to pull out if your existing gear goes into spasm, and can easily do a good job of mixing while you try to get you existing setup working again. Of course, you could buy an iPad Mini, ION iDJ2GO, a Griffin cable splitter and algoriddim djay 2 for a similar price, but it lacks the all-in-one-ness of the PDJ. Ultimately, the aspirational cool factor, the form factor and feature set sells the PDJ. If they can give some of the features the attention they deserve to polish and finish them, the PDJ is a highly attractive proposition for a lot of people. So Vestax UK — you win. It seems I owe you a meal after all. It feels like an expensive bit of gear, and because of the dual touch screens, small size and weight, the PDJ oozes quality. A mixed bag really. It’s pretty poor at some things, but utterly wonderful at others. Thankfully, the bad things could be fixed with future firmware upgrades. Tricky. 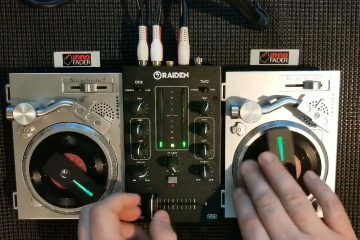 On a practical level, you can do much of what the PDJ does with iPad Minis and cheap controllers, but not with the same style and convenience. But you’ve got to really want the PDJ to justify the price. The PDJ is uniquely fun, but with that comes a steep price tag. It is however considerably more capable than you might think, and provided the issues can be ironed out, this may well find itself garnering a small but evangelical fan base.